The Gemini new-Moon occurs June 16, 2015 at 2.05.20 pm UT and a country's lunation chart provides a forecast model of events for the period June 16 to July 15, 2015. The Sun-Moon lunation is semisquare (friction) Venus — planet of peace, peace makers and social events; conjunction (prominence) Mars — planet of strife, violence, guns, bombs, war, conflicts, fires and accidents; and sextile Uranus — planet of extremism, social unrest, radicalization, freedom-fighting, technology, reform and startling change. 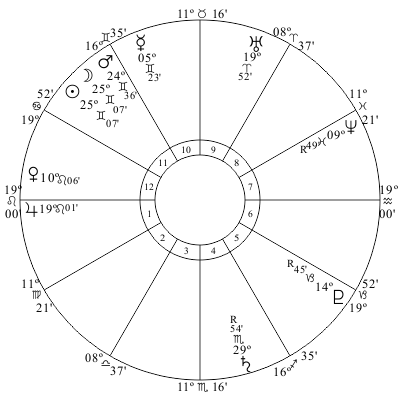 In the Washington chart the lunation and Mars are in house 11 — Congress. Mars stands for war, guns, strife and muscle flexing and the hot-heads in Congress are in an aggressive mood. Venus in house 12 marks for secret peace moves; and Uranus in house 9 marks for new (social media) laws to deal with extremists. Jupiter — the law planet — in house 1 is trine (luck) Uranus. With Mercury in house 10 the administration makes announcements that stir up controversy. Stock prices are set to rise (Jupiter). And Saturn in house 4 marks for destructive weather events — floods — with crop losses and food shortages. On June 18, 2015 progressed Moon moves to form a parallel (intensity) aspect with progressed Uranus > peak date is December 31, 2015. Uranus rules the radical element, radicalization, extremists, social unrest, strikes, demonstrations, revolutions, sudden change, sensational developments, reform, freedom and liberty. It stimulates progressed Sun square (obstacle) birthchart Uranus > peak power and discord date is December 1, 2015. This aspect marks for radical political change, freedom and equal rights, uprisings, social/political unrest and radicalization via social media. Lightning fast moves by rogue leaders cause international shock waves. On July 6, 2015 progressed Moon is trine (luck) birthchart Saturn > end date is August 6. Saturn stands for security, safety issues, conservatism, debt, loss, unemployment, disease and hardship. This aspect stimulates progressed Venus conjunction progressed Saturn. The social problems caused by austerity, debt, unemployment and disease are a key issue. There are 9 aspects formed in the Mars cycle. Events will occur 36 hours before or after the aspect's peak date. Events mapped by Sun aspects in the Sun cycle will occur on the date indicated.